I must apologize for my quickie water marble today. I'm trying to keep up with the #31dc2017 challenge while swatching a handful of large collections. This water marble isn't perfect, but it's the best I could manage with limited time. For this look I started with a base of Bohemian Polish Ballet Slipper. Once that dried I used Shaded Spruce, Royal Lilac, and Orange Pop to water marble over the top. I had a little bit of an oops with the pinkie finger when I went to dab off a water droplet. Normally I would go back and redo the nail, but tonight it just wasn't feasible. The shades featured in this post are not yet available for purchase, but I hope to have swatches of the Bohemian Polish Matte About Fall collection for you soon! If you enjoyed this post you might like 31dc2017 - Galaxy Nails feat. 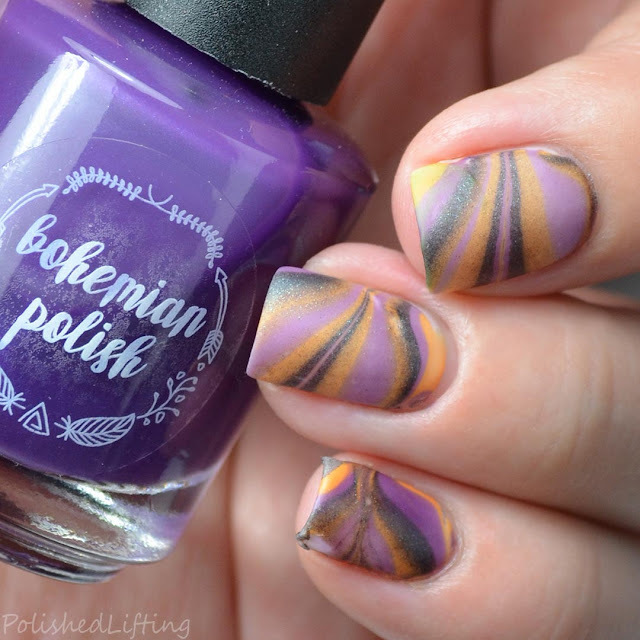 Bohemian Polish Howard's Rock and Holographic Half Moons feat. Bohemian Polish Rock On Chicago.